Markets always bounce back, but sometimes the climb back to the heights is slower than the drop from them. The U.S. real estate market, like the rest of the economy, took years to recover from the shock of the 2008 financial crisis. 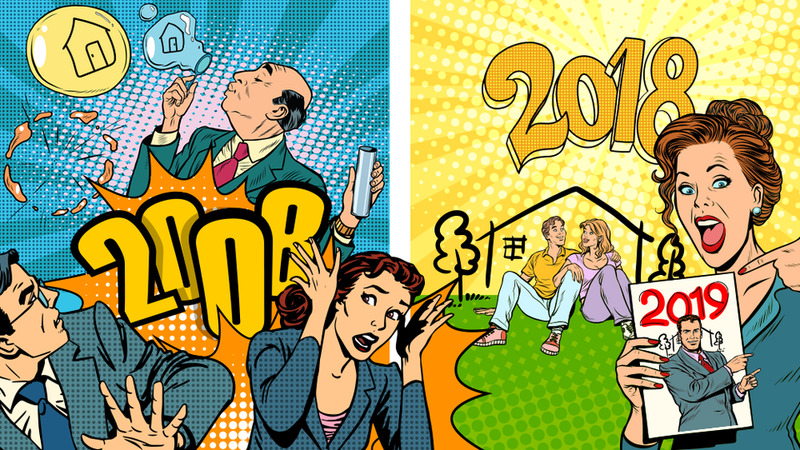 Though observers were pleased with the market in 2017 for the first time in nearly a decade, 2019 is already off to a rocky start, and so skeptics worry that another recession is en route. It’s true that some high-priced markets saw market declines; a global pullback of Chinese investors hurt prices on the West Coast, but 90% of U.S. markets saw price gains in 2018, which suggests that predictions of a new bubble are overwrought. As Lawrence Yun of the National Association of Realtors explained, “We are seeing historically low foreclosure levels, indicating that people are living within their means and not purchasing homes they cannot afford.” Full-year statistics for 2018 have not yet appeared, but evidence suggests that prices soared, just as analysts predicted last January. In November 2018, housing sales volume suffered a 1.5% year-on-year decrease, but prices rose and are expected to continue rising throughout 2019. A strong economy, coupled with low supply and high demand, are expected to fuel a 3.1% price increase in 2019 and a 1% increase in transaction volumes. There’s a dark side to the rise in home prices: In 50% of the top U.S. markets, half of the houses turned out to be overvalued when analyzed with fundamental criteria such as rental income, says Corelogic. Although major cities are especially overpriced, it’s a national problem. Housing affordability is at its lowest level since the 2008 recession, and with higher interest rates and reduced caps for the mortgage interest and State and Local Tax (SALT) deductions, it’s only growing less affordable. The U.S. isn’t building new housing as quickly as it once did, and so many potential homeowners will find themselves in the rental market this year. With prices in cities so high, some may also opt to move to the suburbs, which is a trend expected to grow this year. “Second cities” outside major metropolitan areas may gain younger residents priced out of gentrifying metropolises. Despite concerns about unaffordability, much good news remains: a tight labor market promises accelerated wage growth, while the low oil prices help the general economy grow. Although two interest rate hikes are in the cards for 2019 and 30-year mortgage rates are rising above 5%, we see no increase in foreclosures. Similarly, fewer people are applying for mortgages. These data points suggest that people are borrowing within their means and that we are not witnessing the creation of another bubble. Considering also that the United States saw solid jobs growth in the first days of January, we predict stable or lower sales volumes with accompanying price increases, though we do not expect prices to increase as quickly as they have in the past several years. It’s not surprising that so many proptech startups have made their debuts of late. Crowdfunding legislation in 2012 and 2015 helped, as did growing awareness of the gross inefficiencies of the real estate markets. These ambitious startups aim to improve the real estate transaction process, ease the difficulties of construction, and provide new financing methods. By the end of 2018, venture capitalists and tech investors had put roughly $5.2 billion into real estate proptech startups. It’s likely still too early to gauge the macroeconomic effects of proptech, but this year and the next we may expect increasing deployment of new technologies as both established firms and ambitious up-and-comers seek to capture and consolidate a fragmented market. Lastly, a sector which has seen high growth after the introduction of crowdfunding legislation in 2012 and 2015 is private equity financing of real estate investments and projects. This sector is expected to benefit even more with a new, little-noticed provision of president Trump’s tax overhaul going by the name “Opportunity Zones”, which promises the elimination of capital gains taxes for investments with a 10 year horizon in 8700 underserved areas of the U.S.
We expect some investors in these opportunity zones and not only to invest in novel ways – one such way is through “security tokens,” digital assets powered by “blockchain” digital ledgers. Tokenization, which has already made headways in private equity, promotes the “democratization” of investment by allowing relatively small investors to contribute to projects and enable liquidity for traditionally illiquid assets. By bringing fractional investment opportunities to the general public, tokenization holds the potential to revolutionize the real estate market and bring this asset class into the 21st century.